Just because I wrote The Pruning Book doesn’t mean that I always go forth boldly, pruning shears in hand, to prune with speed and with total confidence. This realization hit me right between the eyes as I was staring at and trying to figure out what to do with a row of St. Johnswort shrubs billowing like a wave over the edge of my terrace. Any more billowing and that mass of stems would become a tsunami; the hedge had to be reduced — attractively. The problem is that the plants are a bit big for the site. I have excuses. There are 400 species of St. Johnswort, varying in stature, and I lost the tag to my original plant from which I propagated all the others in the hedge. The soil in the planting strip used to be weedy and poor. After enclosing the strip in a wall of hypertufa (a mix of cement, peat, and perlite that ends up like volcanic rock) and topping the bed with compost, plants grew better than expected. And the St. Johnsworts were supposed to mingle and compete with potentilla plants in the bed, each showing off its sunny, yellow flowers at various times through summer and keeping the other in check. The St. Johnsworts overgrew and snuffed out the potentillas, so, lacking competition from weeds or potentilla, grew too well. Lopping all St. Johnswort stems back by half or more would not be a good idea. For the rest of winter, the hedge would look hacked back (which it would have been). Hardly the graceful, if oversized, tapering, arching branches presented now. Come spring, new shoots would burst forth mostly near the pruning cuts, the ungainly result, year after year, being wild, new growth sitting atop increasingly, fat stems. After some chin scratching, I chose a different tack. First, I shortened everything to about 18 inches. Then I shortened some of those already shortened stems to various lengths, some to as short as a couple of inches long. Simple. For now, largish wounds do stare out from the hedge, but next year, and in years to come, such wounds will be less plentiful and less evident. 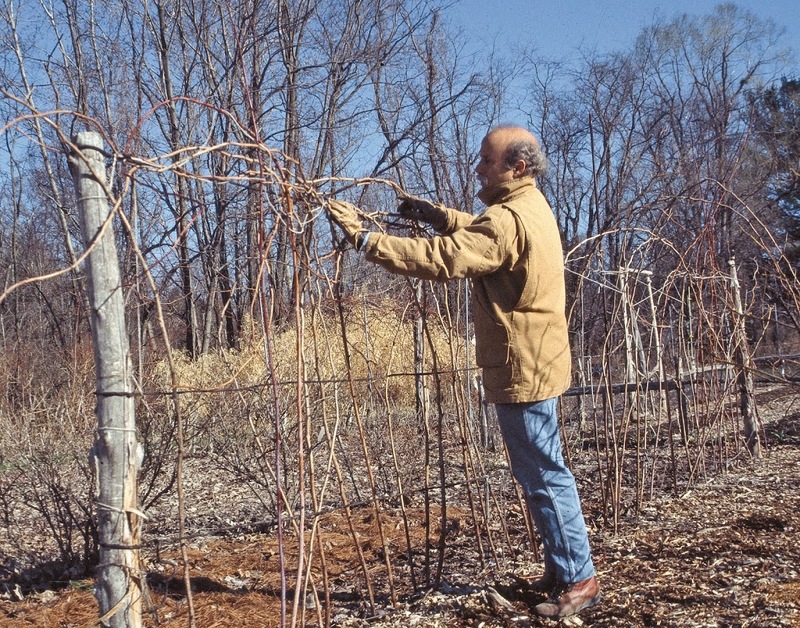 This pruning’s most dramatically shortened stems will sprout just a few, lanky shoots. A greater number, but each less vigorous, shoots will sprout from stems I shorten least severely. Moderately shortened stems will sprout a moderate number of new shoots of moderate vigor, how many and how vigorous related to how much the stem was shortened. The end result — I’m hoping — will be a hedge with shoots of various size and vigor originating at various heights within each shrub. Just like a naturally growing plant. Pruning in subsequent years should be easier. Although this pruning sounds formulaic, it was fraught with decision-making: whether or not to cut and how much to cut, both to achieve aesthetic results now and for the future. 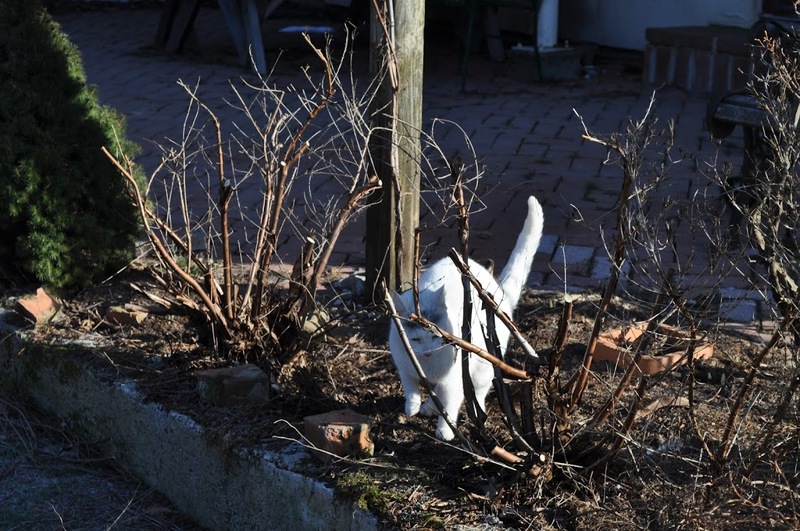 Shrubs readily sprout new shoots naturally and following pruning, so I at least am consoled that pruning rarely harms the plant and that mistakes are soon overgrown. In contrast to pruning St. Johnswort, pruning red raspberries is a no-brainer. All you have to do is follow a 3 step recipe. Step 1: Cut to the ground any stem that bore last summer. These stems look old, with peeling bark, and still hang on to a few remnants of fruit stalks. Step 2: Cut down selected remaining canes. If the swathe of plants is wider than 1 foot, berries are harder to pick and, because of congestion, disease is more likely. I cut down any stems attempting escape beyond that swathe and then, within the swathe, remove enough canes so that none are closer than about 6 inches apart. Sturdiest stems are those most worth saving. Step 3: Shorten remaining canes to about 5 feet in height. This pruning is just to keep stems from flopping around. The height could be more or less, depending on how and if plants are trellised. I leave mine longer and weave the canes together onto a trellis wire about 4 feet from the ground. This entry was posted in Uncategorized and tagged hypericum, potentilla, raspberry, st. johnswort, The Pruning Book. Bookmark the permalink. Trackbacks are closed, but you can post a comment. « Citrus in New York? Remember, you always want to prune from the bottom up, never the other way around. I’ll check back again soon for an update! Good stuff! Yes! Very good point. Unfortunately, too many people do it the other way around. Is the same St. Johns Wort that people take for depression? Do you steep the leaves and make a tea? PS Love the farmden term in your bio. You should patent that!!! Yes, it’s the same St. Johnswort, although there are many species and I’m not sure which is used for depression or how the extracts are made. All I can say is that it made me very happy pruning my St. johnswort on a nice sunny winter day. Glad you like the term “farmden.” It’s descriptive, I think, although my wife doesn’t like the sound. Just discovered your blog through an article (Pruning can give roots elbow room)in my local Sunday newspaper. I’m looking forward to exploring the blog. Do you have any experience with coffee trees in regards to root/stem pruning? After 6 years, I had my first harvest of about 60 cherries. The tree is in my living room, and quite big. It is almost touching the ceiling! There are actually four stems/ trees. I didn’t really notice this until it was already pretty big. I’m going to have to do something…I’m just afraid if I prune, it will be another 6 years until it produces fruit again. Since your plant has 3 stems I’d suggest cutting one of them back by about one-half. Perhaps that stem will still fruit. If it does, then next year you can cut another of the stems back by one-half. And the following year, you could do the same with the third stem. In subsequent years, cut back the oldest stems. This way, the plant will never have any very old stems and will keep cycling younger ones up to bearing age. If that first pruning does does not result in fruit on the pruned stem, you could prune another stem next year back only 1/4. Or you could try bending branches over rather than pruning them back. Keep me posted, please. Have you ever tried to use the trimmed raspberry branches for smoking foods in the grill? I’ve never smoked anything deliberately — on the grill.